Custom software for simple data acquisition and programming of fluke data loggers and gives these excellent machines a new lease of life. 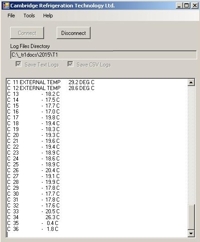 This custom datalogging program for Windows XP and above is built for receiving data from a Fluke 2280 series dataloggers which outputs to a computer serial port (the RS232 module must be installed in the Fluke datalogger). The program is proven to work with Fluke dataloggers 2280b and 2286a. The program datalogger program is passive; it doesn't send signals to the logger, it receives and records whatever data the datalogger sends. The software writes the information to a comma-delimited text file which goes straight into Excel and at the same time writes a standard text file as an exact copy of the datalogger output. The file name is automatic and varies by date. The module runs on its own, no installation required. Some common Windows system files are required though these are usually already there on operating systems Windows 7 and above. If this software could be useful to you, please download our demo version. This demo version will show the data in the "Receive Window" but will not log it to file. Note that the demo file is a simple standalone executable which has been zipped. Your browser may incorrectly warn you that the file is unsafe. The programming software is able to configure the data logger via the serial port and saves the configuration for later use. The full working versions are available on request at a price of £150 for each module or £270 for the pair. Please contact us for this.